A creative activity for the holidays. 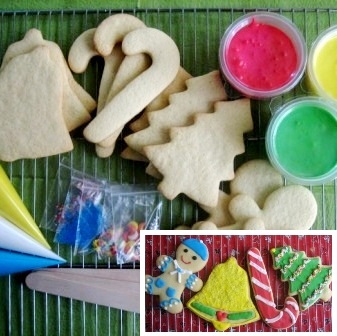 DIY Kit comes with everything you need to decorate 12 Christmas cookies. Kit includes 12 Christmas-themed butter cookies (3 bells, 3 Christmas trees, 3 candy canes and 3 gingerbread men), 3 tubs of royal icing, 3 pipettes of royal icing, 3 frosting wands, and assorted sprinkles. Our royal icing is made with meringue powder imported from the US. Cookies measure approximately 11-13 cm in height. Available during the holidays.